This grand old "opry" house was built by Barton S. Tibbits, whose father platted the town of Coldwater, in 1882. 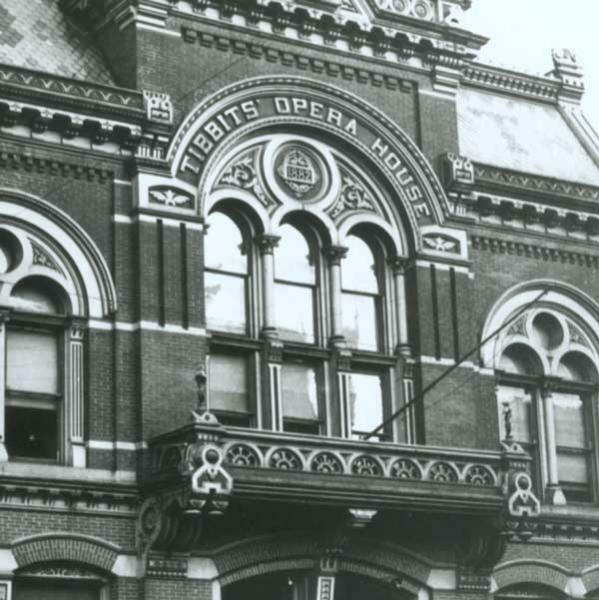 Designed by Mortimer Smith of Detroit, the Victorian era, Italianate style theater hosted its first performance on the evening of September 21, 1882. The marvelous painted murals in the lobby tell the story of the many famous people who have performed here including such Vaudevillians as John L. Sullivan and famed performers as Buffalo Bill, John Philip Sousa and Mack Sennett. Through the years there opera has featured boxing matches, traveling politicians, performing dogs, camel rides and even a beer drinking elephant. In 1912 it became a silent movie house and then during the late 1920s, a movie theater. Now, the old building, saved and renovated by the Tibbits Foundation in 1962, is a live performance theater with such notables Bob Newhart, Woody Herman, The Royal Winnipeg Ballet, Roger Williams, Joseph Cotton, P.T. Barnum, The Dukes of Dixieland, Eddie Foy, Jr., the Chicago Symphony, Ethel Barrymore, the Virginia Symphony, the Chad Mitchell Trio, the Glen Miller Orchestra, the Chenille Sisters and Guy Lombardo. Go to their web site to see what's playing.